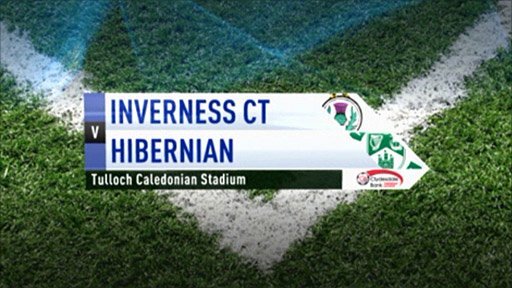 Goals from Richie Foran and Nick Ross either side of half-time helped Inverness beat Hibernian. Foran broke the deadlock on 40 minutes when his angled header from six yards went in off the post. Then 19-year-old Ross opened his account for the season with a sweet volley from the edge of the area that crashed in off the the crossbar. Hibs might have reduced the arrears moments later but David Wotherspoon blasted over from just inside the area. With Inverness having already cemented seventh place in the league, it was Hibs who were looking to perhaps catch St Johnstone in eighth. That is now impossible and their challenge now is not to fall bellow Aberdeen in tenth place when the two teams meet in their season-ending game on Saturday. Portuguese striker Ricardo Vaz Te flashed the first chance wide for Hibs after nine minutes, when he headed Scott Taggart's free-kick after being fouled by Kenny Gillet. The game's first on-target effort stemmed from a Sutherland free-kick midway through the first half, when Grant Munro powered a header straight down the throat of Hibs keeper Jakub Divis. Vaz Te squandered his third opportunity of the game on the half hour when he nodded a Taggart cross wide. Moments later forward David Wotherspoon hammered over from 12 yards after being played through by midfielder Liam Miller. But it was Inverness who opened the scoring in 40 minutes when Foran connected with a deep Ross Tokely cross. The Irishman's angled header from six yards struck the post before rolling along the line and strike partner Adam Rooney made double sure it had crossed over. Just six minutes after the restart Inverness doubled their lead. Rooney hit a deep cross towards the Hibs area, and it broke to Ross who volleyed from the edge of the box, with the ball hitting the crossbar before bouncing over the line. Hibs might have reduced arrears moments later when Vaz Te found Wotherspoon but he blasted over from just inside the area. The visitors were slightly closer with Richie Towell's effort but the low angled 20-yard shot failed to trouble the hosts' Northern Ireland international goalkeeper Jonny Tuffey. Divis saved well from a low Rooney strike just after the hour following a through ball from Sutherland, who might have scored in the closing stages but he fired wide. As the match drew to a close 16-year-old Inverness substitute Liam Polworth came on to become the club's youngest ever first-team player. 90:00+2:44 Shot from just outside the box by Martin Scott goes over the bar. 90:00+1:48 Jakub Divis takes the indirect free kick. 90:00+1:48 Substitution Liam Polworth is brought on as a substitute for Adam Rooney. 90:00+1:48 The referee blows for offside against Richie Foran. 90:00+1:05 Unfair challenge on Aaron Doran by Callum Booth results in a free kick. The free kick is swung in right-footed by Aaron Doran, clearance made by Richie Towell. 90:00+0:24 Shot from just outside the box by Lewis Horner goes over the bar. 89:25 Free kick awarded for an unfair challenge on Victor Palsson by Ross Tokely. David Wotherspoon has a direct shot on goal from the free kick. 88:47 Substitution Aaron Doran comes on in place of Nick Ross. 86:18 Adam Rooney gives away a free kick for an unfair challenge on Jakub Divis. Free kick taken by Jakub Divis. 85:38 Substitution Dani Sanchez on for Shane Sutherland. 84:56 Shane Sutherland takes a shot. Save by Jakub Divis. 83:02 Shane Sutherland has an effort at goal from outside the penalty box missing to the wide right of the goal. 81:43 Corner taken by David Wotherspoon from the right by-line played to the near post, clearance by Lee Cox. 76:11 Substitution Lewis Horner on for Lewis Stevenson. 76:11 Substitution Martin Scott on for Liam Miller. 73:15 Akpo Sodje challenges Ross Tokely unfairly and gives away a free kick. Free kick taken by Jonny Tuffey. 72:10 Inswinging corner taken right-footed by David Wotherspoon from the left by-line, Paul Hanlon takes a shot. Save by Jonny Tuffey. 70:40 Richie Foran takes a shot. Save by Jakub Divis. 69:38 David Wotherspoon takes a shot. Save by Jonny Tuffey. 67:49 Substitution Akpo Sodje on for Scott Taggart. 66:55 Inswinging corner taken from the right by-line by Shane Sutherland. 65:37 Corner taken left-footed by Shane Sutherland, clearance made by Liam Miller. 63:08 Adam Rooney takes a shot. Save by Jakub Divis. 61:41 Free kick awarded for a foul by Victor Palsson on Adam Rooney. The free kick is delivered left-footed by Shane Sutherland from right wing. 60:36 Corner taken right-footed by David Wotherspoon, Adam Rooney makes a clearance. 55:58 Richie Towell has an effort at goal from outside the box which goes wide left of the goal. 54:05 Effort from deep inside the area by David Wotherspoon clears the bar. 51:45 Grant Munro fouled by Liam Miller, the ref awards a free kick. Free kick taken by Jonny Tuffey. 50:27 Richie Foran provided the assist for the goal. 50:27 GOAL - Nick Ross:Inverness CT 2 - 0 Hibernian A goal is scored by Nick Ross from just outside the penalty box to the top right corner of the goal. Inverness CT 2-0 Hibernian. 46:47 Shane Sutherland concedes a free kick for a foul on Liam Miller. Liam Miller takes the direct free kick. 46:02 Corner taken short by Scott Taggart. 43:59 Inswinging corner taken by Shane Sutherland from the right by-line, save made by Jakub Divis. 43:37 Foul by Victor Palsson on Lee Cox, free kick awarded. Direct free kick taken by Chris Hogg. 42:36 Free kick awarded for a foul by Callum Booth on Stuart Duff. Shane Sutherland takes the free kick. Correction - 41:01 GOAL - Richie Foran:Inverness CT 1 - 0 Hibernian Richie Foran finds the back of the net with a goal from close range to the bottom left corner of the goal. Inverness CT 1-0 Hibernian. 41:01 Assist on the goal came from Richie Foran. 41:01 GOAL - Adam Rooney:Inverness CT 1 - 0 Hibernian Adam Rooney scores a goal from close range low into the middle of the goal. Inverness CT 1-0 Hibernian. 40:04 David Wotherspoon fouled by Nick Ross, the ref awards a free kick. Free kick taken by Jakub Divis. 36:49 Outswinging corner taken left-footed by Shane Sutherland from the left by-line, Liam Miller manages to make a clearance. 36:16 Outswinging corner taken left-footed by Shane Sutherland played to the near post, clearance by Scott Taggart. 33:24 The assistant referee flags for offside against Adam Rooney. Indirect free kick taken by Jakub Divis. 32:39 Foul by David Stephens on Ross Tokely, free kick awarded. Jonny Tuffey takes the direct free kick. 32:11 Outswinging corner taken right-footed by David Wotherspoon from the right by-line. 31:13 Effort from deep inside the area by David Wotherspoon clears the bar. 30:32 Ricardo Vaz Te has a headed effort at goal from deep inside the area missing to the right of the goal. 29:19 David Wotherspoon takes a outswinging corner. 28:12 Outswinging corner taken by David Wotherspoon from the right by-line, clearance made by Richie Foran. 25:54 Kenny Gillet challenges David Wotherspoon unfairly and gives away a free kick. Direct free kick taken by David Stephens. 25:29 David Wotherspoon is flagged offside by the assistant referee. Free kick taken by Jonny Tuffey. 24:48 Adam Rooney is ruled offside. Free kick taken by Jakub Divis. 24:30 Richie Foran fouled by Richie Towell, the ref awards a free kick. Free kick taken by Richie Foran. 23:16 Grant Munro takes a shot. Jakub Divis makes a save. 22:38 Unfair challenge on Richie Foran by Richie Towell results in a free kick. Free kick taken by Shane Sutherland. 19:58 Stuart Duff gives away a free kick for an unfair challenge on Liam Miller. David Stephens restarts play with the free kick. 15:38 Ricardo Vaz Te has a headed effort at goal from deep inside the area missing to the right of the goal. 15:06 Free kick awarded for a foul by Kenny Gillet on Ricardo Vaz Te. Scott Taggart takes the free kick. 14:22 Unfair challenge on Nick Ross by David Wotherspoon results in a free kick. Shane Sutherland delivers the ball from the free kick left-footed from left wing, David Stephens manages to make a clearance. 11:33 Corner taken by Shane Sutherland from the right by-line, David Stephens makes a clearance. 8:29 Ricardo Vaz Te has an effort at goal from close in which goes wide left of the goal. 5:38 David Wotherspoon takes a outswinging corner. 3:57 Free kick awarded for an unfair challenge on David Stephens by Lee Cox. Jakub Divis restarts play with the free kick. 1:00 Adam Rooney challenges Paul Hanlon unfairly and gives away a free kick. Callum Booth restarts play with the free kick.